Thought of by many as the microcosm of the entire United States, Illinois is as much a center for thought and education as it is a center for industries such as manufacturing and energy. A leading refiner of petroleum in the United States, Illinois is thought of as leading oil refiner in addition to a leading biofuels exporter. Illinois is in a peculiar position in relation to both the Rust Belt and the Grain Belt, a crossroads for truck, air, and rail travel. Truck driving sees a large presence of its activities stemming from the Chicago area, with a highly diverse pool of freight to be shipped from General Electric to Kraft Foods. There is no one economy in the state that employs more than 14% of the entire population – with freight to be moved all across the map. If you are looking for a truck driving job and you want to be in a more metropolitan type of area, than Illinois is definitely the place to be. Moving almost 75% percent of the state's manufactured freight and more than 1.2 millions tons everyday, the trucking industry is vital to Illinois and so are its truck drivers. Matt Hart, executive director of the Illinois Trucking Association says the trucking industry employs up to 333 000 people in Illinois and with companies competing to keep their workers, the average salary is $50,000 for each employee alone. 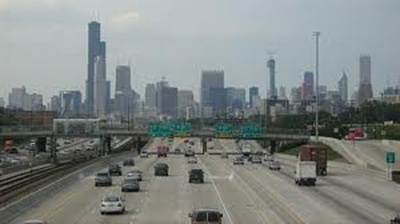 Although the economy and rising fuel costs have affected the trucking industry like everyone else, the Illinois Department of Transportation reports that for the first time in three years, commercial truck traffic rebounded in Illinois last year. The Illinois Trucking Association has seen its membership increasing as well; currently they have 355 member companies in total. Many in Illinois see building a strong base of skilled workers as the key to rebuilding the economy and trucking company Schneider National and Olive Harvey College are one such example of a partnership determined to reverse the driver shortage and replenish the pool with new qualified commercial drivers. In six to eight weeks time and for a relatively small investment, new trainees can go from unemployed or underemployed to great new careers that offer complete benefits, retirement plans and steady paychecks -- earning $50,000 or more per year in a short time. Whether you attend these training schools or not, a trucking job is not just a job. In Illinois it's a career in high demand, can never be outsourced, offers great pay and always has room for advancement. Not only are there hundreds of thousands of good-paying jobs available in trucking today, companies like Schneider National in Illinois say trucking driving is becoming better than what it used to be. Gone are the days of being gone for the weeks previously spent driving, working and living in uncomfortable trucks constantly on the road. Its now becoming as many as 75% of Schneider's drivers getting home at least once a week and new state of the art trucks offering more comfort and convenience such as Internet access with detailed directions at the touch of a finger. Internet access is also the key to finding these trucking jobs and the best jobs Illinois employers have to offer. Not only are companies like Schneider using on-line technology to better operate their businesses, their entire hiring process is done on-line as well. From job postings at every location to on-line applications for you to submit right then and there, TruckDrivingJobs.com is your first stop before landing the perfect truck driving job in Illinois. Illinois is the land of opportunity when it comes to today's truck driver jobs and TruckDrivingJobs.com is the one stop shop to landing them. Its only a matter of getting on-line and determining the best possibilities for you. Below are list of companies currently hiring within illinois. Call 618-629-2572Based out of Whittington, Express Ltd owns 965 trucks and primarily transports regular Flatbed & Reefer loads, Fresh Produce. Call 815-249-5037Based out of Grand Ridge, W E Bernard Trucking owns 654 trucks and primarily transports regular Flatbed & Reefer loads, various metals such as Brass, Titanium, Copper, Iron, Logs, Poles, Beams, Lumber, Building Materials, Machinery, Oversized loads such as Farm Mining or Oilfield equipment, Petroleum Gas & Natural Gas, Grain, Feed, Hay, Dry Van, Farm Supplies, Construction equipment, Toxic Materials. Call 815-455-6008Based out of Grant Park, T A Schmidt Trucking owns 670 trucks and primarily transports regular Flatbed & Reefer loads, Logs, Poles, Beams, Lumber, Refrigerated Food, Paper Products, FROZEN HERBS. Call 847-367-5300Based out of Libertyville, H & H Towing And Auto Repair owns 488 trucks and primarily transports Car hauling, Reposession & Towing, Machinery, Oversized loads such as Farm Mining or Oilfield equipment. Call 309-629-3077Based out of Alpha, J & J Neice owns 723 trucks and primarily transports regular Flatbed & Reefer loads, Fresh Produce, Meat, Refrigerated Food, Beverages, Paper Products. Call 309-476-8211Based out of Lynn Center, S & O Aerial Construction Co owns 354 trucks and primarily transports Construction equipment. Call 815-675-6193Based out of Mchenry, D & L Midwest owns 317 trucks and primarily transports regular Flatbed & Reefer loads, various metals such as Brass, Titanium, Copper, Iron, Car hauling, Logs, Poles, Beams, Lumber, Building Materials, Mobile Homes, Machinery, Oversized loads such as Farm Mining or Oilfield equipment. Call 815-589-3562Based out of Fulton, Nancy Jo Smith owns 460 trucks and primarily transports SNACK FOODS. Call 309-446-3708Based out of Laura, R & N Trucking owns 996 trucks and primarily transports regular Flatbed & Reefer loads, Grain, Feed, Hay, Coal, Coke, Dry Van, Construction equipment, building materials,flooring & asphalting supplies. Call 815-624-4129Based out of Rockton, H C Anderson Roofing Co owns 500 trucks and primarily transports Building Materials, Garbage, Refuse, Trash, Construction equipment, ROOFING. Call 815-634-5959Based out of Coal City, K & C Transport owns 247 trucks and primarily transports regular Flatbed & Reefer loads, various metals such as Brass, Titanium, Copper, Iron, Car hauling, Logs, Poles, Beams, Lumber, Building Materials, Machinery, Oversized loads such as Farm Mining or Oilfield equipment, Intermodal Containers, Oilfield Equipment, Grain, Feed, Hay, Farm Supplies, Construction equipment. Call 618-549-9619Based out of Carbondale, K & M Insulators owns 330 trucks and primarily transports Building Materials. Call 630-485-1189Based out of St Charles, C & C Logistics owns 132 trucks and primarily transports regular Flatbed & Reefer loads, Machinery, Oversized loads such as Farm Mining or Oilfield equipment, Fresh Produce, Meat, Dry Van, Refrigerated Food, Beverages, Paper Products. Call 309-796-0731Based out of East Moline, A & K Excavating owns 470 trucks and primarily transports Machinery, Oversized loads such as Farm Mining or Oilfield equipment, Construction equipment. Call 708-746-5570Based out of Midlothian, J & L Services owns 888 trucks and primarily transports regular Flatbed & Reefer loads, Dry Van, Refrigerated Food, Beverages, Paper Products. Call 847-455-3546Based out of Melrose Park, A & J Cartage owns 778 trucks and primarily transports regular Flatbed & Reefer loads, various metals such as Brass, Titanium, Copper, Iron, Paper Products. Call 618-465-5611Based out of Alton, D & R Machine Company owns 615 trucks and primarily transports regular Flatbed & Reefer loads, Machinery, Oversized loads such as Farm Mining or Oilfield equipment. Call 618-532-8344Based out of Walnut Hill, S & L Produce owns 899 trucks and primarily transports Fresh Produce. Call 630-694-0360Based out of Bensenville, St Leading Cargo Express owns 319 trucks and transports all kinds of freight. Call 618-869-2491Based out of Claremont, S & S owns 996 trucks and primarily transports regular Flatbed & Reefer loads, Machinery, Oversized loads such as Farm Mining or Oilfield equipment, Grain, Feed, Hay. Call 773-307-9384Based out of Joliet, C & L Munoz Trucking owns 136 trucks and transports all kinds of freight. Call 815-693-0961Based out of Richmond, S & S Servicer owns 910 trucks and primarily transports Construction equipment. Call 847-478-0634Based out of Lincolnshire, Quality Produce Shippers owns 659 trucks and primarily transports regular Flatbed & Reefer loads, Refrigerated Food, Paper Products. Call 847-366-3308Based out of Buffalo Grove, I & L Trucking owns 203 trucks and transports all kinds of freight. Call 815-584-1012Based out of Gardner, F & F Farms owns 705 trucks and primarily transports regular Flatbed & Reefer loads, Grain, Feed, Hay, Farm Supplies. Call 815-458-6289Based out of Wilmington, O'reilly Trucking owns 910 trucks and primarily transports regular Flatbed & Reefer loads, Grain, Feed, Hay, Coal, Coke. Call 815-944-8689Based out of Pembroke Twp, R & D Dandurand Farms owns 867 trucks and primarily transports regular Flatbed & Reefer loads, various metals such as Brass, Titanium, Copper, Iron, Logs, Poles, Beams, Lumber, Building Materials, Machinery, Oversized loads such as Farm Mining or Oilfield equipment, Fresh Produce, Grain, Feed, Hay, Coal, Coke. Call 618-836-7108Based out of Plainview, A & J Ottwell Trucking owns 203 trucks and primarily transports Logs, Poles, Beams, Lumber, Building Materials, Grain, Feed, Hay, building materials & Sand ETC. Call 217-632-7233Based out of Petersburg, K & B Trucking Of Il owns 442 trucks and primarily transports regular Flatbed & Reefer loads, various metals such as Brass, Titanium, Copper, Iron, Logs, Poles, Beams, Lumber, Building Materials, Machinery, Oversized loads such as Farm Mining or Oilfield equipment, Fresh Produce, Oilfield Equipment, Livestock, Grain, Feed, Hay, Dry Van, Refrigerated Food, Paper Products. Call 618-658-4016Based out of Vienna, W Bozarth Logging owns 177 trucks and primarily transports Logs, Poles, Beams, Lumber. Call 618-783-3539Based out of Wheeler, M & J 1 Trucking owns 565 trucks and primarily transports regular Flatbed & Reefer loads, Household Goods, Refrigerated Food. Call 217-342-4777Based out of Effingham, B & B Mobile Home Sales owns 198 trucks and primarily transports Mobile Homes, Construction equipment. Call 815-544-7100Based out of Belvidere, H And H Specialized Hauling owns 305 trucks and primarily transports Building Materials, Mobile Homes, Machinery, Oversized loads such as Farm Mining or Oilfield equipment, Coal, Coke, Farm Supplies, Construction equipment. Call 708-599-1412Based out of Hickory Hills, A & M Contracting owns 383 trucks and primarily transports Logs, Poles, Beams, Lumber, Building Materials, RR TIES. Call 815-234-5930Based out of Stillman Valley, Oak Hill Custom Mill owns 969 trucks and primarily transports Logs, Poles, Beams, Lumber, Building Materials, Machinery, Oversized loads such as Farm Mining or Oilfield equipment. Call 708-429-9012Based out of Lockport, E D S Express Courier owns 937 trucks and transports all kinds of freight. Call 630-550-5105Based out of Streamwood, F & J Hauling owns 342 trucks and primarily transports Refrigerated Food. Call 630-980-1048Based out of Roselle, A & J Motors owns 932 trucks and primarily transports regular Flatbed & Reefer loads, various metals such as Brass, Titanium, Copper, Iron, Building Materials, Fresh Produce, Intermodal Containers, Meat, Garbage, Refuse, Trash, Refrigerated Food, Beverages, Paper Products, Construction equipment. Call 708-474-5750Based out of Lansing, B & B Farms Of Lansing owns 745 trucks and primarily transports Fresh Produce. Call 618-756-2404Based out of Belle Rive, B & K Transportation owns 319 trucks and primarily transports regular Flatbed & Reefer loads, Grain, Feed, Hay, Dry Van. Call 815-648-2399Based out of Hebron, Tom Leider's Greenhouses owns 472 trucks and primarily transports FLOWERS/POTTED PLANT. Call 815-448-2169Based out of Mazon, C & R Transfer owns 721 trucks and transports all kinds of freight. Call 815-368-3080Based out of Wenona, B & B Trucking owns 168 trucks and primarily transports regular Flatbed & Reefer loads, various metals such as Brass, Titanium, Copper, Iron, Logs, Poles, Beams, Lumber, Building Materials, Machinery, Oversized loads such as Farm Mining or Oilfield equipment, Petroleum Gas & Natural Gas, Grain, Feed, Hay, Coal, Coke, Dry Van, Farm Supplies, Construction equipment, Fertilization supplies. Call 815-693-7348Based out of Des Plains, H & I B Enterprises owns 107 trucks and primarily transports regular Flatbed & Reefer loads, Fresh Produce, Meat, Refrigerated Food, Beverages, Paper Products.